When it comes to finding out how public schools are performing, it is difficult to get straight answers. Senior district staff publish individual school results, but avoid comparing schools, claiming it is unfair and misleading to compare schools based only on academic achievement scores. Parents are quick to find student and school performance data posted on websites and shared among educators. They also know that the established benchmark is the percentage of students “meeting expectations” usually defined as the established board or provincial standard of competence. Tall poppies and undernourished plants stand out in the garden. The same is true for high performing schools and those struggling in a school system — and the Halifax Region Centre for Education (HRCE) system is no exception. 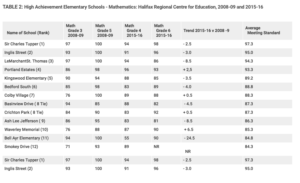 Students attending elementary schools in Halifax’s most affluent districts, with few exceptions, outperform all others in student achievement. That common assumption is confirmed by comparing student test scores in the former Halifax regional school board’s benchmark year, 2008-09, with those in 2015-16, eight years later. Three of the top five performing Halifax elementary schools, Sir Charles Tupper, LeMarchant-St. Thomas, and Inglis Street, are located in the city’s affluent South End, all near the downtown campuses of Dalhousie and Saint Mary’s universities. 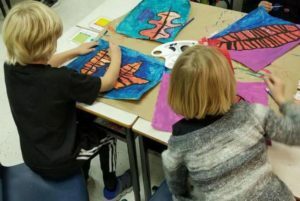 In all three schools, over 92 per cent of all students in grades 3 to 6 met or exceeded established standards in two critical competencies, reading and mathematics. LeMarchant-St. Thomas offers French immersion, which is attractive to upwardly mobile, university-educated parents. It competes with three of Nova Scotia’s best known independent private schools, Halifax Grammar School, Sacred Heart School/Fountain Academy and Armbrae Academy, all located in relatively affluent neighborhoods that are populated by health-care and university professionals. 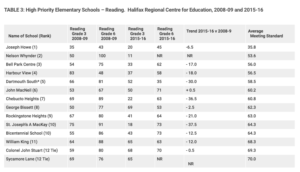 The top 10 schools of 95 elementary school programs, ranked on the reading and math scores of their students, were located in south-end Halifax, two Dartmouth suburbs (Colby Village and Portland Estates), northern exurbs, (Waverley and Fall River), and in old Dartmouth (Crichton Park and Hawthorn). Two other schools where students perform exceedingly well are in the city’s western outer suburbs, Shatford Memorial in Hubbards and Kingswood in Hammonds Plains. Students are attracted to the tiny Primary to Grade 6 Hubbards school of 80 students by the opportunity to qualify for Shatford Memorial Trust scholarships. About $275,000 a year is awarded to graduates upon entrance to university or college. Schools in Bedford, a fast-growing suburb popular with young families and pockets of high-income enclaves, finished just outside the top 10 in grades 3 to 6 reading. Crowded schools, larger classes, and long bus rides may well explain the lower than anticipated student test scores. 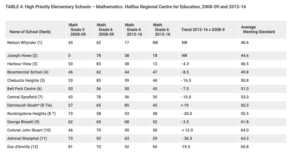 Twenty of the Halifax area’s 95 elementary schools were identified in 2014 by superintendent Elwin LeRoux and senior staff as priority schools, where students “consistently perform below provincial standards” in literacy and mathematics. 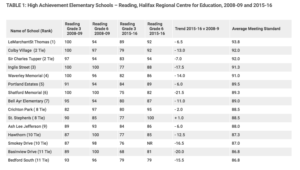 The 10 lowest performing schools, comparing 2008-09 and 2015-16 student results, confirm the HRSB’s 2014 study findings that the struggling elementary schools tend to be located in disadvantaged neighbourhoods in “low income pockets” of Halifax region. The most acute ‘high priority’ schools are located in north-end Halifax (Joseph Howe), North Preston (Nelson Whynder), Lake Echo/East Preston (Bell Park Centre), Dartmouth North (Harbour View), Spryfield (Chebucto Heights), and Dartmouth/Woodside (Dartmouth South Academy). Students attending these schools score below 50 per cent of the provincial standard in mathematics and less than 60 per cent in reading. Most of the struggling schools were located in urban, mostly rental housing districts or in aging suburbs. One North Dartmouth school, Harbour View, is described by community development advocates as “the priority school of all priority schools.” Over 85 per cent of the dwelling units in the area where Harbour View is located, for example, consist of low-rental private market housing, much of it built since the 1970s. In north-end Halifax where Joseph Howe School is located, the average household income was $44,190, indicating that families are mostly drawn from the lowest two income groups. On the suburban fringe, off the Halifax Peninsula, the low performing schools tend to be situated in lower income school attendance areas like Spryfield, Woodside and Preston. Your postal code — or where you live — is often considered a prime indicator of the quality of education in your local school. Our four-part series, focusing on the Halifax school system, tests the validity of that claim and delves into factors that contribute to the stark inequities from one school to another. Series author Paul Bennett spent months researching the issue, breaking down student test results school-by-school and interviewing the key players. The final instalment looks at what more can be done to raise standards and close the achievement gap. Paul W. Bennett, director of Schoolhouse Institute, Halifax, is the author of Raising the Bar and Closing the Gap: Schools, Income and Student Success.